Here at Airedale Springs, we pride ourselves on the quality of our service and products, the dedication of our staff and our commitment to the environment. Whether our customers are looking for a small batch of handmade, bespoke springs or a bulk order of compression springs, we consistently enjoy the satisfaction of knowing that we’re providing the best service we possibly can. However, every now and again we also get recognition for our achievements – and that’s also very enjoyable. Our most recent success came at the Keighley Business Awards; created to recognise the achievements of businesses within the Keighley and District area, this is an important awards ceremony for us because it brings with it the recognition of our local community. As a family-run business with strong local ties, this means a great deal to us. This year, the awards ceremony was a glamorous black-tie affair for 220 guests, held at the Victoria Hall and hosted by BBC Look North presenter Harry Gration. Last year, at the inaugural event, we took home one award – the Environmentally Friendly Business of the Year, which sadly wasn’t a category this year. If it had been, we feel quite certain that our ongoing commitment to the environment would have certainly placed us amongst the contenders! Whilst we would have been pleased to simply match that success, this year we were delighted to bring back no less than three awards! The award for Employer of the Year is one we’re particularly proud of; our staff have always been the foundation of our success, as reflected by the fact that we were the first spring manufacturers in the UK to receive Investors in People status, back in 1993. In addition, we were given special recognition as a runner-up in the Manufacturing or Engineering Business of the Year category, awarded the title of Large Business of the Year, and took the coveted overall title of Business of the Year. Our chairman Tim Parkinson accepted the awards, and dedicated them to the staff in recognition of all their hard work and achievements over the years. 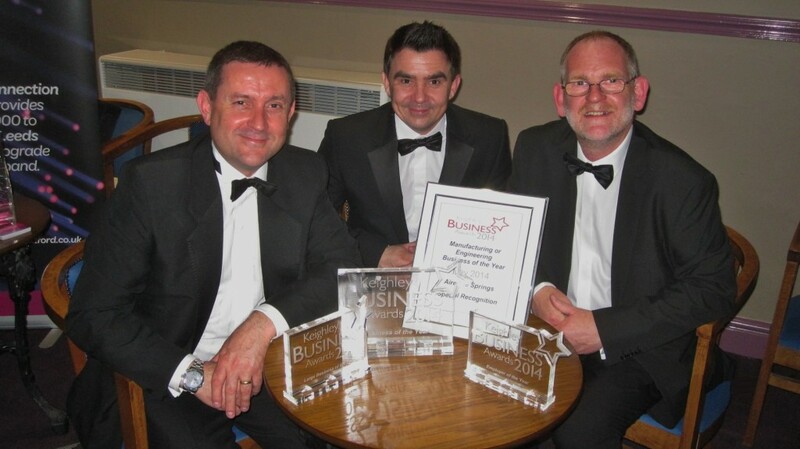 The Keighley Business Awards followed hard on the heels of another recent success, at the Regional MX Awards. The Institute of Mechanical Engineers offer an online assessment audit to help companies to improve their overall performance based on an internationally recognised benchmark. The assessment is a rigorous process, which took time to complete thoroughly, but which resulted in a benchmarking report which helps to identify areas of potential improvement as well as areas of excellence. When our chairman Tim Parkinson undertook the assessment, he found it a very valuable tool, which highlighted a number of issues to take to the management team for improvement. He didn’t realise at the time that completing the assessment automatically entered the company for the Manufacturing Excellence (MX) Awards, so it was a surprise when we learned that we had been shortlisted – and had in fact ranked as one of the last three finalists for the Yorkshire/North East area, taking runner-up status at a ceremony in Sheffield’s Cutlers Hall last April. You can read more about the Manufacturing Excellence Awards and our experience with the assessment here. What these awards really highlight for us is the dedication of all of our staff, who have helped to make Airedale Springs a real British success story through their hard work and commitment to meeting the needs of all of our clients. For more information on our services, or to discuss your requirements for springs, wireforms or pressings, please call us on 01535 643456 or use the form on our contact page.